a lazy abundance of food that discouraged thought of the future. The shores here are crowded with immense shoals of herring, and the Indians are lazily catching just enough to eat. Those we had for dinner are not nearly so good as those I ate last year at Cross Sound. The Yukon salmon, however, are not in excellent condition, and are the largest by far that I have seen. Yet the Yukon Indians suffer severely at times from famine, though they might dry enough in less than a week to last a year. June 20. Another delightful sun-day. Cloudless, nearly, lily spangles on the bay. Temp. 65 in shade at noon. Birds nesting. Plants coming rapidly into bloom. 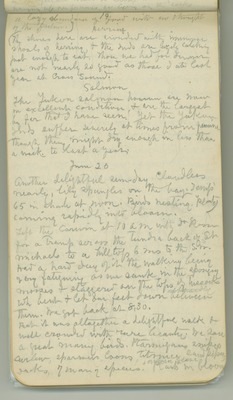 I left the Corwin at 10 o’clock in the morning with Dr. Ross for a tramp across the tundra back of St. Michaels to a hilltop 6 miles to the S.W. We had a hard day of it, the walking being very fatiguing as we sank in the spongy moss and staggered on the tops of tussocks which bent and let our feet down between them. We got back at half-past eight. But it was altogether a delightful walk and well crowded with rare beauty. We saw a great many birds – ptarmigan, snipes, curlew, sparrows, loons, titmice, sandpipers, and ducks of many species. Plants in bloom.